It has been said that Louis XIV once said of architecture (think Versailles) that no heating or air conditioning (not an option then) was as important as symmetry. Remember, comfort was at a premium anyway, as no one could actually sit down in the presence of the king; and with no indoor plumbing, water in pitchers and basins turned into ice in the winter. Le roi du solei demanded and doted on grand symmetry at all cost (and it did end in melting down all the silver furniture at Versailles to maintain this bricks and marble metaphor of the sun king). I have to confess that I never really understood the transition from the symmetrical baroque to the asymmetrical rococo (think petit hameau and petit trianon at Versailles) except as a “new” style or fad. Antithesis always supplants thesis after all, and the curvilinear arabesque was exactly that. We had a cold front come through last week, so we finally got out into the garden to see what we could do before the rest of summer hits us here in Florida. Alas, the bedraggled garden needed truck loads of mulch, and we just couldn’t buy that much. So we borrowed a neighbor’s truck, and absconded with other neighbor’s black plastic bags of leaves awaiting the “green” removal service. We did it in broad daylight, carefully selecting residents without dogs, and made several trips. We began pulling weeds and dumping the leaves on what was once total symmetry. Paths defined circles, the boxwood topiary did circles within circles, and I tried to maintain this against every conceivable challenge of flooding, the return of the jungle, etc. But after areas of boxwood succumbed to flooding (quite a few of which had been replanted at least once), I decided to let things go asymmetrical. But it wasn’t until today that I discovered what I was experiencing. Symmetry and artifice? Hubris, yes, arrogance as well. Just like Louis. Suddenly, I had a flashback. Jill and I, along with my great aunt Mabel, were slowly hiking to the Tuckerman Ravine trail from the Appalachian Club at the base of Mt. Washington in New Hampshire. Uncle Gus had gone ahead, and ended up taking the bus from the summit back…we never made it up the mountain at all. At one point the three of us were sitting on a log, while Jill devoured a chocolate bar a fellow hiker had given her. Aunt Mabel, sans lorgnettes that she used to peer through in the 50’s, scanned the forest and said…”how unkempt…well, that’s nature for you.” She had met Uncle Gus when he was at Syracuse University studying forestry. Goodyear (or Firestone) sent my uncle to Africa, where he built his first rubber plantation. Then there was one up the Amazon in Brazil, then Indonesia, then the last one near the mouth of the Amazon. That was where they built a swimming pool that had a stream flowing through it so the water was always fresh. While Uncle Gus subdued the jungle, Aunt Mabel bought tableclothes embroidered in an Italian convent, and trained the servants while teaching the workers’ children English and writing. But I digress. Aunt Mabel and Louis saw horticulture in the same way: man orders and controls. Think about all the really boring suburban sprinkler-maintained lawns and trendy shrubs as opposed to, say, an English country garden. 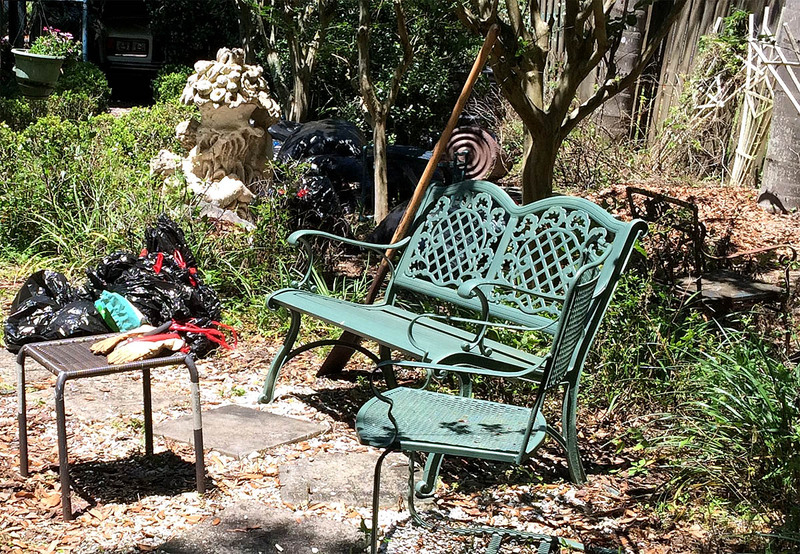 And here I sit on a “period” aluminum bench, ready to rip all the black bags open and mulch our out-of-round garden. Jill had insisted on the infamous “red mulch” to match the neighbor’s planting facing the street, as we sort of share a bed. But in the back, I was reveling in a new found freedom of recycling what nature had blessed us with. I was a romantic, not a classicist, glorying in my asymmetrical situation. So toodle-oo Louis…and Aunt Mabel. I’m not going to worry about waist high weeds with the more frugal and effective mulch of the small live oak leaves. And I can get on with my life at the ocean, knowing the weeds are under control, and the acid loving plants are happy. The rococo was all about freedom and appreciating the natural and providential. Think of all the political revolutions that blossomed in the 18th century. Triumphs over tyranny! 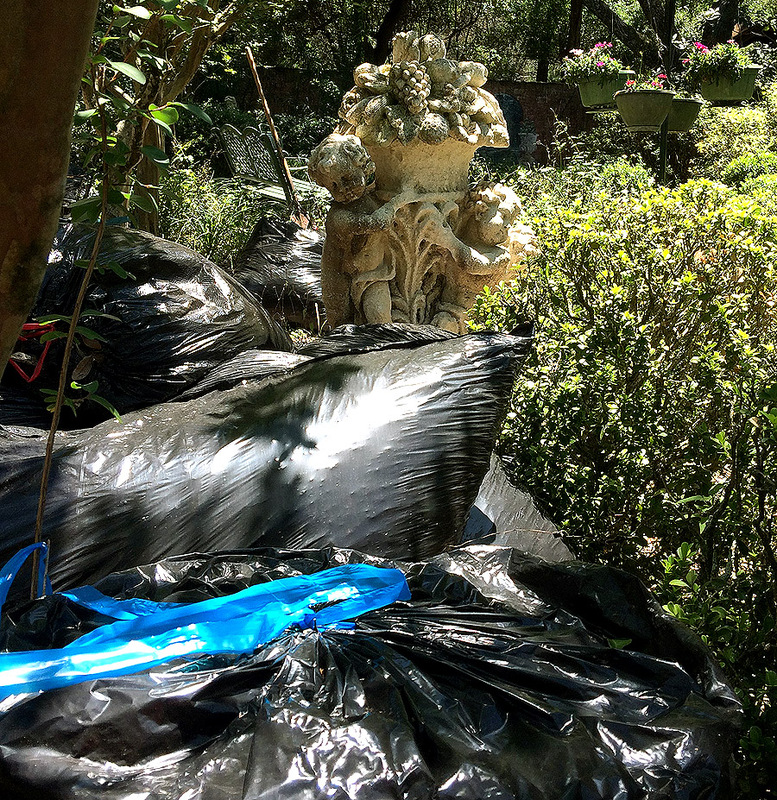 How natural: our leaves in black plastic bags so nicely collected and packaged by our neighbors! Just as the rococo loved the informal asymmetrical “English” garden, we are all about back to nature, with a contemporary twist.